First published Feb 1, 2019. Having a nutritionally balanced diet means consuming just the right amount of calories, protein, vitamins, minerals, and other important nutrients. The benefits of eating right include a stable weight, low cholesterol, and a healthy blood pressure, as well as optimised energy levels. But can supplements help us to consume all that we need on a daily basis? Below we take an in-depth look into Nature’s Bounty Optimal Solutions Complete Protein & Vitamin Shake Mix, to see whether this nutrient-rich powder offers the right benefits for the right price. Nature’s Bounty Optimal Solutions Complete Protein & Vitamin Shake Mix is a nutrient-rich powder designed especially for women. Along with the advertised mixture of protein and vitamins, this rich formula also claims to contain probiotics, digestive enzymes, and collagen (for improved hair, skin, and nails). The product comes in the form of a powder that is designed to be mixed with water or milk. It comes in one flavour (vanilla bean). What Are The Side Effects Of Nature’s Bounty Optimal Solutions Complete Protein & Vitamin Shake Mix? Customers should not expect to experience side effects as a result of using this product. Occasionally, overconsumption of protein-rich powders can result in mild side effects like bloating, gas, nausea, and weight gain. How Much Does Nature’s Bounty Optimal Solutions Complete Protein & Vitamin Shake Mix Cost? 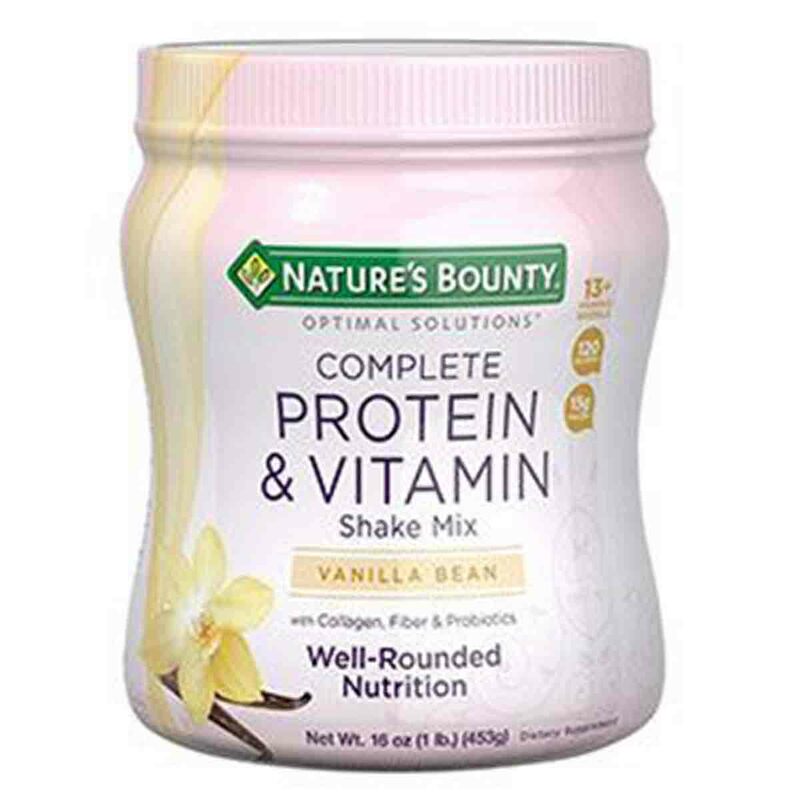 Nature’s Bounty Optimal Solutions Complete Protein & Vitamin Shake Mix is quite pricey given its simplicity. A single 16oz pack costs around $12-$22 on Amazon depending on the seller – however, a single pack only contains approximately 13 servings. Bulk purchases made on Amazon quickly see prices soar to unreasonable levels. Buying 2 16oz packs of Complete Protein and Vitamin Shake Mix (26 servings) costs a shocking $110! Having a nutrient-rich supplement designed for women seems like a great idea, especially with all the added benefits such as improved hair, skin, and nails. However, a good idea needs a good execution, and this product falls at every hurdle. Put simply, this Complete Protein and Vitamin Shake Mix doesn’t do anything! It simply contains some protein (from an undeclared source) mixed with vitamins and minerals. All other benefits, from healthier skin/hair to the improved digestive health, are total duds – the manufacturer appears to have shoved in tiny, ineffective doses of probiotics and collagen seemingly for the sake of it. It’s also hard to say that this shake is truly “healthy” in general – it contains 6g of sugar and 120 calories per serving, yet is lower in protein per serving than most comparable protein shakes. Customers appear to like it, largely because it makes for a tasty, vanilla shake. However, we cannot recommend a supplement that fails to offer any real health or life benefits. Besides that, it remains a touch too expensive for a morning snack. We do not recommend Nature’s Bounty Optimal Solutions Complete Protein & Vitamin Shake Mix to our readers. Nature’s Bounty Optimal Solutions Complete Protein & Vitamin Shake Mix is a supplement that claims to meet the “key nutritional needs of women”. This unique blend contains a mixture of amino acids, probiotics, vitamins, minerals, and digestive enzymes, and is supposedly designed to stimulate lean muscle growth, as well as support a healthy digestive system, skin and nails. The Complete Protein and Vitamin Shake Mix is produced and sold by Nature’s Bounty (formerly known as NBTY). Nature’s Bounty is one of the larger supplement companies around, with their products selling both online and in major retailers like Walmart. 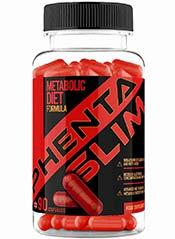 They are mainly known for health supplements like multivitamins, amino acid blends, and fish oil capsules. However, this large brand has also been accused of serious consumer violations by groups like Consumer Reports and the New York Attorney General’s office. Previous investigations have shown that Nature’s Bounty products have claimed to have ingredients on the label that laboratory tests fail to find in the powders/capsules themselves. More worryingly, a second investigation found that harmful PCBs could be found in samples of Nature’s Bounty fish oil. The company can be contacted via the details supplied on their official website. Mix two (2) scoops (33 g) with 8 oz of water. To increase the protein content to more than 20 grams per serving and enjoy a creamy texture, mix with 8 oz of skim milk. Shake can also be enjoyed by mixing with your favorite vegetarian milk alternative. Best served ice cold. What Does Nature’s Bounty Optimal Solutions Complete Protein & Vitamin Shake Mix Claim To Do? This product claims to provide customers with a source of protein and vitamins that they can consume as part of a tasty shake. 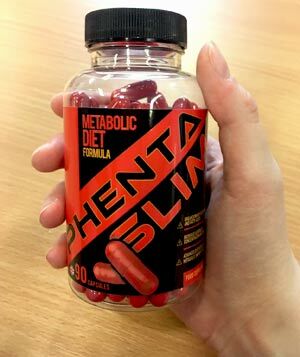 The manufacturers specifically state that it is designed for women, as it provides a balance of nutrients that women supposedly require. In addition, this protein and vitamin mix is also said to support healthy hair, skin, and nails, as well as delivering better digestive health and a reliable source of energy. Does Nature’s Bounty Optimal Solutions Complete Protein & Vitamin Shake Mix Work? Complete Protein and Vitamin Shake Mix could be regarded as a bit of a jack-of-all-trades and master of none. It provides a source of protein, vitamins, and minerals as advertised. However, the probiotic blend is extremely weak and likely improperly transported/packages, and the use of 3mg of collagen to improve skin, hair, and nail health is similarly unimpressive. Customers should expect few benefits. What Are The Ingredients of Nature’s Bounty Optimal Solutions Complete Protein & Vitamin Shake Mix? The ingredients found in Nature’s Bounty Optimal Solutions Complete Protein & Vitamin Shake Mix are listed below. The quantities listed are correct for a 2-scoop (33g) serving. Each serving also contains 120 calories, 2g of fat, and 6g of sugar. Stevia Extract (Stevia rebaudiana) (leaf) 108mg: This is a low-calorie sweetener. Does Nature’s Bounty Optimal Solutions Complete Protein & Vitamin Shake Mix Have Any Side Effects? This product is highly unlikely to cause side effects. Protein and collagen supplement may sometimes cause bloating or a sense of heaviness in the stomach. Are There Any Customer Reviews For Nature’s Bounty Optimal Solutions Complete Protein & Vitamin Shake Mix? The majority of the reviews for Complete Protein and Vitamin Shake Mix are positive, with most customers praising the taste and consistency of the shake. Negative comments are sometimes made about the product’s extraordinarily high price point, with some also finding the taste of the shake to be slightly artificial. Good amount of vitamins and protein. Easy to digest. Tastes good and price is reasonable. I was not happy with this protein shake. Did not give me any more energy (which most protein shakes give me some) and I only got about 10 shakes out of it. 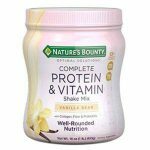 Does Nature’s Bounty Optimal Solutions Complete Protein & Vitamin Shake Mix Offer a Money-Back Guarantee? On the “Terms and Conditions” section of Nature’s Bounty website, the company claims to provide refunds for dissatisfied customers as long as items are returned within a certain time limit. 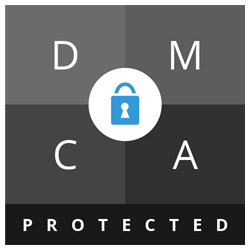 However, the time limit is never specified, and the legalese appears to refer to a separate returns policy that can’t be found elsewhere on the website. We recommend speaking with the manufacturer before attempting to return this product. Where Can I Buy Nature’s Bounty Optimal Solutions Complete Protein & Vitamin Shake Mix? Nature’s Bounty Optimal Solutions Complete Protein & Vitamin Shake Mix is available to buy online on Amazon, and may be found in-store at Walmart, Holland & Barret, and other supplement stores and supermarkets. How does Nature’s Bounty Optimal Solutions Complete Protein & Vitamin Shake Mix compare to Phentaslim? The Diet Pills Watchdog does not recommend Nature’s Bounty Optimal Solutions Complete Protein & Vitamin Shake Mix.